Did you know that some dogs who have never left Winnipeg have been tested positive for Lyme Disease? The tiny deer tick that can transmit Lyme Disease does not need long grassy areas to live in, they are often found in leaf litter, under ground cover plants, around stone walls or wood piles, or even in cut and raked lawns. By following these three tips you can decrease your dog’s chance of being bitten by a tick and becoming infected with tick born diseases including Lyme Disease. Use a tick preventative medication. There are many types of tick prevention available, unfortunately many of the preventatives available from pet stores don’t work well, or can even cause serious burns to your pet’s skin. At McPhillips Animal Hospital we can help you find the right prevention for your pet, depending on their lifestyle. We have different types of preventatives available, depending on your pet’s lifestyle. We recommend starting tick prevention on April 1st and ending November 1st each year. Feel free to give us a call (204-589-8381) or come in any time to discuss which product would be right for your dog. Remove any ticks you do find on your dog. While prevention does decrease the number of ticks your dog will get, it may not be able to eliminate 100% of the ticks 100% of the time. We recommend you routinely check your pet for ticks and remove any ticks you do find. Keeping dogs well groomed will help with finding any ticks they may get. 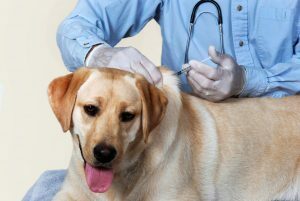 Vaccinate your dog for Lyme Disease. Even when using tick preventative, as well as doing a regular ‘tick check’ on your dog, there is still a small chance a tick may become attached and transmit disease, such as Lyme Disease. Deer ticks are extremely small and tend to be extremely difficult to find on a dog, even when fully engorged. A Lyme vaccine needs a booster 2-3 weeks after the first time it is given, and then should be repeated yearly to provide the best protection. Ticks become active once it is 4°C. If we are having unseasonably warm days in the winter, it is possible for ticks to emerge, causing a potential for infection outside of the April – November ‘tick season’. Having the yearly Lyme vaccine can help to protect your dog all year round. 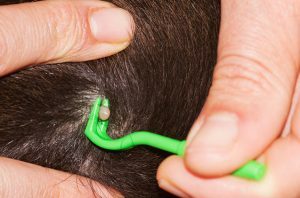 By following these three tips you will significantly decrease the chance that your dog will become bitten by a tick and infected with Lyme Disease and other diseases carried by ticks. Regardless of what method of prevention you choose, yearly testing is recommended to make sure your pet is free from tick borne diseases. As always, do not hesitate to contact McPhillips Animal Hospital to find out how we can help keep your pet healthy and happy! © 2019 McPhillips Animal Hospital Winnipeg Manitoba.